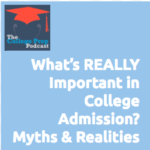 193: What’s REALLY Important in College Admissions? Myths and Realities. Many families are confused about where to start with college admissions, and Megan has noticed there is a lot of faulty information out there. In this episode, she lays out, in concrete terms, what’s important when prepping for college and corrects some myths that many families have.